Last time we heard about HTC's next flagship smartphone, the U12 was quietly displayed during a 5G event held by a Taiwanese carrier on its home turf. Aside from the fact that it may be an indication that the U12 will be equipped with a Qualcomm X20 LTE modem that supports download speeds of up to 1.2 Gbps, few other details about the phone were made available at that date. Well, it appears that a Russian journalist managed to find out more about the HTC U12 and was willing to share the information with the whole world. His findings somewhat come in line with what we've been able to learn, so there specs list could be 100% accurate. As expected, the HTC U12 will boast a larger 6-inch display with Quad HD resolution and 18:9 aspect ratio. The phone won't come with an AMOLED screen, but the standard Super LCD display that HTC usually puts inside its flagships. On the inside, the U12 will pack a Snapdragon 845 processor, 6GB RAM and 128GB expandable storage. The smartphone will come with a dual-camera setup on the back (12MP+16MP), and a secondary 8-megapixel selfie camera. HTC's flagship will feature IP68 certification, a decent 3,420 mAh battery, as well as 5G and dual-SIM support. When it comes to software, HTC U12 is expected to ship with Android 8.0 Oreo on board, along with Sense 10, HTC Face Unlock and Edge Sense 2.0. The smartphone's back and front sides will be coated in glass, while the frames will be made of metal. As far as pricing goes, HTC U12 is rumored to hit the shelves in April for around $880, but prices may vary by region. 880??? Are you asking for another low-selling product? They better have bogo at that price. If HTC does this maybe I will go back to them, the design better be good though and a headphone jack please. They were one of the first to dump the jack.. Sad but true... I don't see them going back. Another oversized 6" flagship phone. Flagship phones are supported to be one handed like the s9. You mean like a remote control? My phone is shorter than s9 and is no one handed.. Less than 14cm is one handed.. My hands are not small. HTC has a real chance here, with all this other notch-failures. Hope they are smart. It's a shame they don't use amoled though. On paper this sounds like a really nice device. Every flagship will have the same specs. No surprises there... The only fear and uncertainty now is.. Will it have the dreaded NOTCH? Lol. 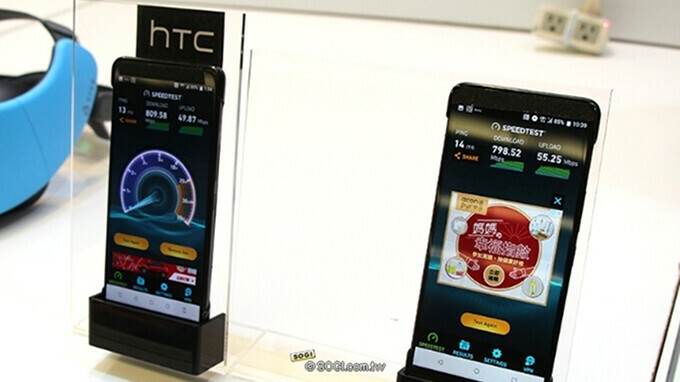 Stop, people dreaming, there will be no comeback for HTC. This OEM is dead. This year will be another in RED. Nothing else but just another oversized and overpriced phone on the market. Not even worth to know anything else about this and tons of other similar devices. Better have some deals that bring this price down about 400 bucks. They hot to remember who they are competing with in that price range. It boggles the mind that a company struggling to stay afloat continues to price its handsets as if it were the dominant brand. who ask you to pay by the way? is HTC forcing you to buy their product? LOL! LCD screen too. What's the excuse for the price? How bout wait to see what the actual price will be? The unlocked US U11 was $650. And the LCD screen is perfect, nothing wrong with it. Why not 2000$!? I mean, since they are not trying to get new buyers, and only goal is to take more money from their, smaller and smaller, group of fans...they should take as much money as they can. They are testing fans patience with LCD screens, dumping audio jack, and many more bad solutions...so why not with higher price? I am shore that they would find 1000-10000 people willing to buy it for 2000$. Heck, why not even more...let's say 5000$, so they could call it most expensive "mass product phone"!? Not much more people will buy it for 880$, so with much bigger price, they could at least keep presenting their brand as status symbol,like they still thinks they are. Hope HTC would bounce back pretty well. Its disheartening to see the state of once the best android manufacturer who pioneered many innovations of the smartphone arena. They really should've kept it. Considering audio was definitely a strong positive focus of their brand.